As you know, bodybuilding has been a passion and a path to my success. David has captured the essence of the sport and at the same time redefined it in a spectacular fasion in this book. Raw power transformed to art – I love it. 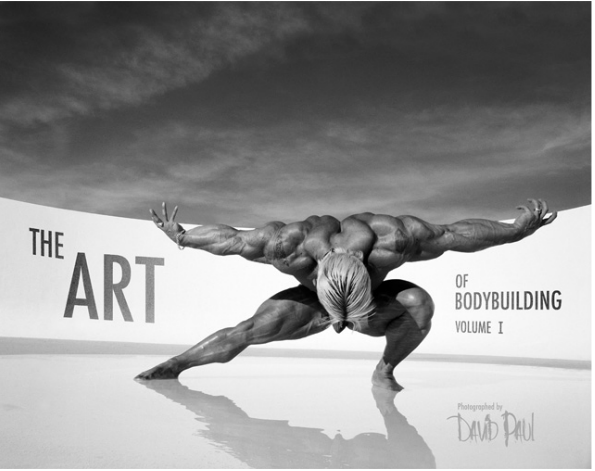 We are proud to announce the newest David Paul release, The Art of Bodybuilding. David’s many years and many friendships in the sport of bodybuilding have enabled him to create this first book in a series of masterpieces. Volume I features some of the most famous strength trainers ever, including Jay Cutler, Mike O’Hearn, Lee Priest, and Flex Wheeler, amongst others. All of the black and white photographs in Volume I were shot with Polaroid cameras, using natural light. These bodybuilders sculpt their bodies as if they were statues made of muscle mass. David Paul does a fantastic job of celebrating the human form using these ripped weightlifters as his muse. David Paul spent years in front of the camera as part of the legendary body building duo, The Barbarian Brothers, famous for many films in the 1980′s. When David retired from acting and professional weightlifting, he turned his immense talents towards music, poetry and photography. David Paul is an artist, poet, musician and photographer with an extraordinary ability to capture the essence of his subjects. His visionary work has been displayed in some of the finest art galleries in the world. Whether he is photographing muscle and fitness, fashion or soul, David utilizes natural lighting to create truly awe-inspiring works of art.